I usually make Chilli bajji/Milagai bajji / Mirchi bajji without any stuffing. 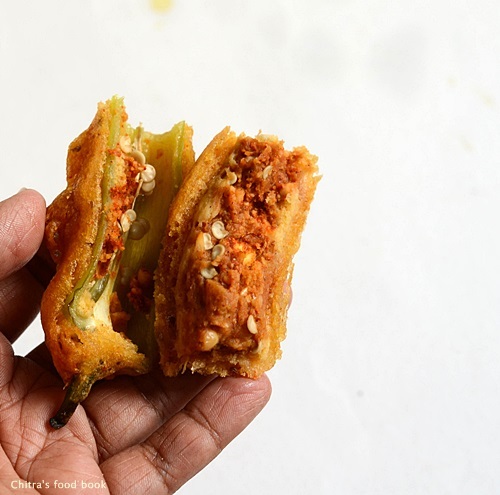 Recently when I was talking with my friend Shalini, she told me about this Andhra style chilli bajji with a spicy stuffing. 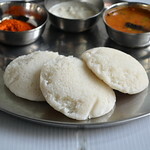 In Telugu,they call it as “Mirapakaya bajji”. The moment she told about this recipe, I started drooling and felt like tasting it right away. Without any delay, I bought the bajji milagai on the same day and made it for our evening tea time snacks. By getting an idea from Shalini, I googled some Andhra style stuffed chilli bajji recipes with tamarind, roasted gram dal or roatsed peanuts. I watched few you tube videos for the stuffing part. But I followed my usual bajji batter recipe for the outer cover. I was completely happy and satisfied with the outcome .U can use either homemade bajji mix as I did or store bought instant bajji/bonda mix.What more to pen down,spicy stuffed chilli bajji along with hot ginger tea tasted divine for us. 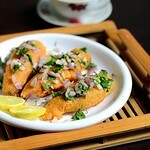 .Friends,try this chilli bajji in this weekend and share your feedback with me. 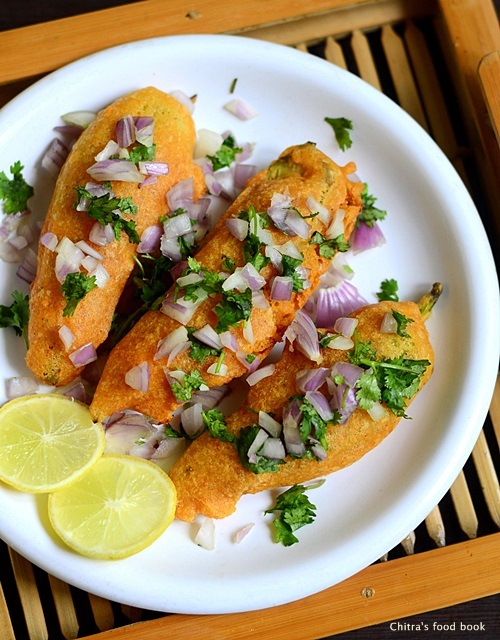 Serve hot hot bajji topped with finely chopped onions and coriander leaves drizzled with lemon juice.I am sure your family will enjoy it to the core.Lets see how to prepare this spicy,hot Andhra style stuffed mirchi bajji recipe with stepwise pictures. 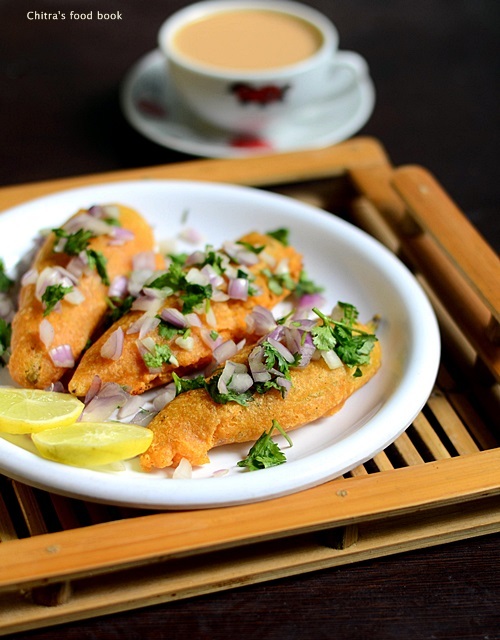 Andhra style mirchi bajji recipe for evening tea time ! To make Andhra michi bajji, take all the ingredients given under “for stuffing” and grind them to a paste.Check for taste and add more chilli powder if u need. 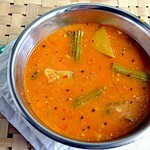 Wash and cut the chillies into two vertically.Remove the seeds partially or completely based on the spiciness u need. Keep it aside. 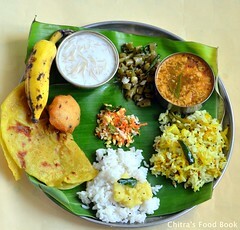 Stuff the chilli as u like and arrange in a plate. In a wide bowl,take the flours,soda,salt and mix well to a paste adding little water.Now add more water and bring it to dosa batter consistency.Make sure there are no lumps in the bajji batter.The chilli should be well coated with the batter.So make the batter slightly thick.Too thick batter gives u hard bajji and too thin batter makes tails in the bajji.So consistency of batter is very important. 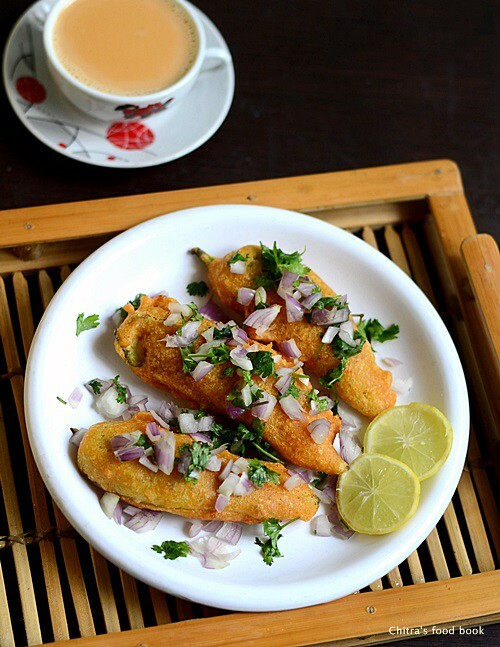 Now take a stuffed chilli and dip in the batter.Heat oil to deep fry.To check the heat of oil,put a pinch of batter and if it rises immediately,batter is just right.simmer the flame and drop the chilli coated with bajji batter by holding its stem. Deep fry both the sides till golden brown and crispy.Enjoy eating hot with tea/coffee ! Chop the onions & coriander leaves finely.Sprinkle some salt and add few drops of lemon juice.Mix well.Top them & serve the bajji. 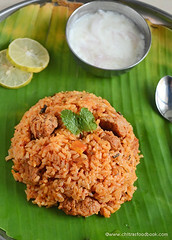 You don’t need any chutneys for this.But kids may like it with tomato sauce.So serve accordingly ! 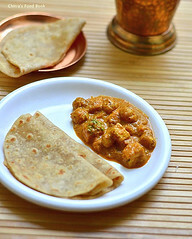 The consistency of batter is very important.To check the right consistency,just dip ur finger in batter.If its coated well,the consistency is correct.If the batter is too thin,finger won’t be coated completely.In that case,add some besan and rice flour to adjust the consistency.Check for salt n proceed. 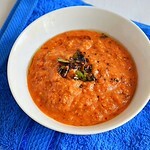 For variations,u can powder & grind roasted peanuts and sesame seeds instead of gram dal. Adding ajwain to the bajji batter helps for easy digestion.So do not avoid it.If u don’t have ajwain in hand,use jeera/cumin seeds. 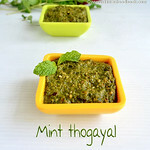 Enjoy this hot,Andhra mirapakaya bajji with your evening tea/coffee ! A sip of tea a bite of bajji is delish !! stuffed bajji looks so tasty.. 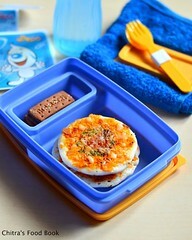 I had this in a restaurant but never tried at home.. should try! That's too tempting one. Best ones to have with a cup of tea. 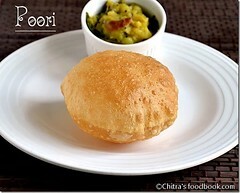 wow spicy bhajji , v too do like this , always love to eat . they r looking perfect . 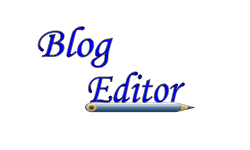 If stuffing is left over, can we use it in other dish? If yes,how can it be used and in what dish? wow,that's so quick.Iam glad to see your feedback :) Thanks!